(Nanowerk News) Researchers from Yale-NUS College and the University of Fribourg in Switzerland have discovered a novel colour-generation mechanism in nature, which if harnessed, has the potential to create cosmetics and paints with purer and more vivid hues, screen displays that project the same true image when viewed from any angle, and even reduce the signal loss in optical fibres. The study was published in the peer-reviewed journal Small ("A Literal Elytral Rainbow: Tunable Structural Colors Using Single Diamond Biophotonic Crystals in Pachyrrhynchus congestus Weevils"). P. c. pavonius, or the “Rainbow” Weevil, is distinctive for its rainbow-coloured spots on its thorax and elytra (see attached image). These spots are made up of nearly-circular scales arranged in concentric rings of different hues, ranging from blue in the centre to red at the outside, just like a rainbow. While many insects have the ability to produce one or two colours, it is rare that a single insect can produce such a vast spectrum of colours. Researchers are interested to figure out the mechanism behind the natural formation of these colour-generating structures, as current technology is unable to synthesise structures of this size. Dr Saranathan and Dr Wilts examined these scales to determine that the scales were composed of a three-dimensional crystalline structure made from chitin (the main ingredient in insect exoskeletons). 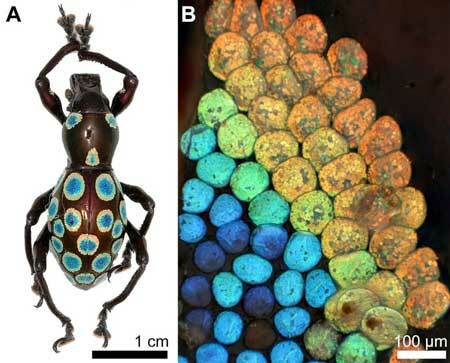 They discovered that the vibrant rainbow colours on this weevil’s scales are determined by two factors: the size of the crystal structure which makes up each scale, as well as the volume of chitin used to make up the crystal structure. Larger scales have a larger crystalline structure and use a larger volume of chitin to reflect red light; smaller scales have a smaller crystalline structure and use a smaller volume of chitin to reflect blue light. According to Dr Saranathan, who previously examined over 100 species of insects and spiders and catalogued their colour-generation mechanisms, this ability to simultaneously control both size and volume factors to fine-tune the colour produced has never before been shown in insects, and given its complexity, is quite remarkable. “It is different from the usual strategy employed by nature to produce various different hues on the same animal, where the chitin structures are of fixed size and volume, and different colours are generated by orienting the structure at different angles, which reflects different wavelengths of light,” Dr Saranathan explained.